Attention TrulyRichClub Members This Program Will Teach YOU How To Run Towards YOUR Millions! I want to help you become a multimillionaire. I was poor missionary for many years. 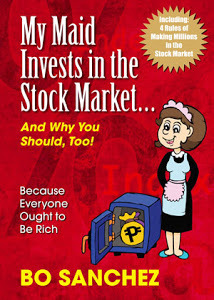 But when I got married and got into business (and succeeded after many painful failures) and learned how to invest my profits into the Stock Market—I became a millionaire missionary. It’s been amazing, believe me. Oh, the sheer freedom! Do You Want Freedom From Money Problems? The freedom of not having to worry about next month’s bills. Or not worrying where to get money for my kids’ college. Or not worrying how I’ll help my aging mother (she’s 87 as I write this). Or not worrying about debts (because I don’t have any). Do You Want Freedom To Fund God’s Work? I love the freedom to help others. Once upon a time, I used to get a small monthly allowance from my Catholic community. But when my businesses started to earn money, I told my treasurer to stop paying me. For years now, I love the fact that I don’t get paid from the tithes and offerings of my members. Not only that, I now have the incredible freedom to dig from my own pocket and finance our ever-expanding ministries. Orphans. Scholarships. Prison Ministry. Abandoned elderly. Media evangelism. You name it, we do it. Today, I also support many of our missionaries. I cannot describe to you the overflowing joy I feel. I also love the freedom of just loving my family. I love dating my wife in nice restaurants every week. I love bringing out my kids for family vacations. Because we homeschool them, we can leave town anytime we want to. So we go out 6 times a year! Our last trip was in Baguio. We had to hire a 40-seater bus because I decided to bring my mom, my parents-in-law, all my sisters, their husbands, all my nephews and nieces… You get the picture. We stayed in a hotel for 5 days. It was a total riot. Look. I’m not here to brag. That’s the last thing I want to do. I mentioned these things to you to tell you that being rich has many benefits if your heart is in the right place. So how will you become rich? My friend said the three ways to become rich are as follow: (1) Be a movie star like Julia Roberts; (2) Be an athlete like Manny Pacquiao; Or (3) marry a rich person like Julia Roberts or Manny Pacquiao. How Will You Get The Pot Of Gold On The Mountain Top? Imagine three friends who heard of a gigantic pot of gold sitting on top of a mountain. The only way to reach it was by foot. The first guy chose to WALK up the mountain. The second guy, a little bit more fit than the first guy, chose to RUN up the mountain. What happened to the guy? He collapsed after running like a maniac for 30 minutes. He suffered a heart attack and he had to be carried down the mountain in a stretcher. A lot of people are so in a hurry at getting rich, they become blind to other more important things: Their family, their health, their values, and their relationship with God. Friend, life is a marathon, not a 100-meter dash. Yes, I know marathons are still considered a race, but in one sense, it’s not. A marathon finisher is still a big WINNER, not just the first guy who crossed the finish line. The first way—Walking to your Millions—is something that I’ve already taught you. Most likely, you’re already doing: Investing in the Stock Market each month using SAM (Strategic Averaging Method). “Walking to your Millions” is brilliant. I’m happy to announce that THOUSANDS ofTrulyRichClub Members are already investing each month in the Stock Market, and they WILL BECOME multimillionaires in 20 years, with some much earlier than that. Managers, maids, market vendors, morticians, masseuses, and messengers… As long as your job title starts with “M”, you’ll become a multimillionaire. Just kidding. (By now, I hope you’re used to my goofiness.) Whatever job you have, whatever letter it starts, you’ll become a multimillionaire, if you follow our simple investing formula. But today, I’d like to talk about running to your wealth. Second, because you’ll grow up. Don’t ever make getting rich about the money. It’s about who you’ll become in your journey towards wealth. And believe me, that journey will shape your character. Your heart will grow bigger. Your thinking will mature. Your capacities will be stretched. If you follow God’s way of love throughout the entire journey of becoming a multimillionaire—you’ll become an awesome person. You’ll inspire your friends and family. You impact their lives in incredible ways. WALKING to your Millions is about being an Investor. RUNNING to your Millions is about being an Entrepreneur. In the past 16 years, I’ve failed in 12 businesses. I fell flat on my face and ate dirt. I crawled on mud. I cried buckets. I lost millions. I lost face. And I thought I lost my desire to be an Entrepreneur. BIGGEST ANSWER: Because no one taught me! No one was there to MENTOR me in business. I just did everything on my own. No one taught me how to select the right product, or the right strategy, or the right numbers. No one taught me how to select the right Entrepreneurial Pathway. No one taught me how to stick to my Core Zone. I DON’T want you to experience my pain. It was horrible. Today, my businesses are incredibly successful. I sometimes pinch myself: Is this really happening to me? Wasn’t it just a few years back when I wanted to give up and just stick to preaching? Today, I want to teach you how to achieve the same success. I want to teach you how to “run” to your wealth (Not Race! ), so that you become rich around SOONER, not later. They say that a wise person is someone who learns from his mistakes. But guess what. There’s someone wiser than that. I say that the WISEST person is someone who learns from other people’s mistakes! I want you to learn from my mistakes. You don’t have to repeat my stupidity. I’ll teach you how to avoid my failures. I can share with you my Mentors’ phenomenal wisdom. I’m launching a very special group within the TrulyRichClub called Diamond EntrepCircle. In this level, Dean Pax Lapid and I will be your virtual teachers. We will teach you how to be great Entrepreneurs. Let me introduce Dean Pax to you. He’s a dear friend and the Dean of Entrepreneurship of the TrulyRichClub. He also is a Professor at AIM, one of the most prestigious business schools in Asia. But he’s not just a classroom professor that teaches from an old textbook. He has an ARMY of successful businesses. Heck, he starts one new business a year. He owns an IT company, a fuel distribution business, gas stations, retail stores, and many more. I know I’m biased, but I believe, hands down, Dean Pax is THE BEST TEACHER AND COACH of Entrepreneurship in the entire country. I’m designing this program for people who are not yet as wealthy as they want to be. Let me say again what the Diamond EntrepCircle is: It’s a Step-by-Step Plan for becoming wealthy SOONER, not in 20 years. Do you still have debt? I’ll teach you a step-by-step plan on how to get rid of all debt. Imagine the freedom to have no debt! Believe me, unless you get rid of unwise debt, you can never get rich. It’s impossible. Why? Because Compounded Interest is a fantastic friend but a fearsome foe. I strongly urge you to make Compounded Interest your ally (through investing), not your enemy (through debt). Are you confused as to what business to get into? I’ll help you discover the right “Entrepreneurship Pathway” for you. You’ll learn that there are major Pathways of becoming an entrepreneur (plus many subcategories). I want you to find the best Pathway that fits your passion, personality, gifts, and resources. Do you know what your main gift is? I’ll help you find your “Core Zone”. Because it’s only in your Core Zone where you can succeed. Many people fail in their business because they’re doing something totally outside this Zone. But if you stick to your Core Zone, success will be just around the corner. Are you in Network Marketing? I’ll teach you why many people fail in Network Marketing or Multilevel Marketing (MLM), and how you can avoid the same failures. I’ll also give you the simple selection criteria on choosing the right MLM company. And I’ll also give you the powerful strategies necessary to succeed in this field. There are so many scams out there, so please be careful. Sometimes, the main product of the franchising business is selling the franchise to poor franchisees who will never earn. First, I’ll guide you to find out whether franchising is something that’s for you or not. Second, I’ll teach you how to AVOID franchising scam and choose the right franchise for you. Do you want to be a Speaker, Author, Coach, Seminar Leader, and Infomarketer? In the Diamond EntrepCircle, you’ll learn about the whole world of Information Marketing. But that phrase, Information Marketing, does not capture (for me) the breadth and depth of this incredible business. I prefer to call this Wisdom Giving.I’ll teach you how to package your wisdom and monetize it through books, talks, websites, membership sites, etc. Is your business without systems? Most often, business failure happens because there are no Leadership systems, Cashflow systems, and Marketing systems. I’m an artist by heart, and this makes me allergic to SYSTEMS. But I’ve long realized that unless there are systems in place, I cannot be really spontaneous. You’ll learn all these powerful systems for your new business. Do you know how to live rich? I’m an expert in this skill and I want to pass it on to you: I want to teach you how to live like a billionaire without being a billionaire. You need to learn how to live comfortably without burning a hole in your pocket. I’ll share with you the simple strategies for enjoying life and NOT paying the full-price for the little luxuries in life. I’ll show you a dozen ways where you can earn additional income. If you can add P10,000 to P100,000 more into your pocket every month through these ways, how will that impact your life, your investing, your generosity? “Yes Bo, Teach Me How To Run Towards My Millions!